Vote this year, get free beer! The Geese and Fountain in Croxton Kerrial is joining a growing list of pubs around the country seeking to encourage people to register to vote in the forthcoming General Election. 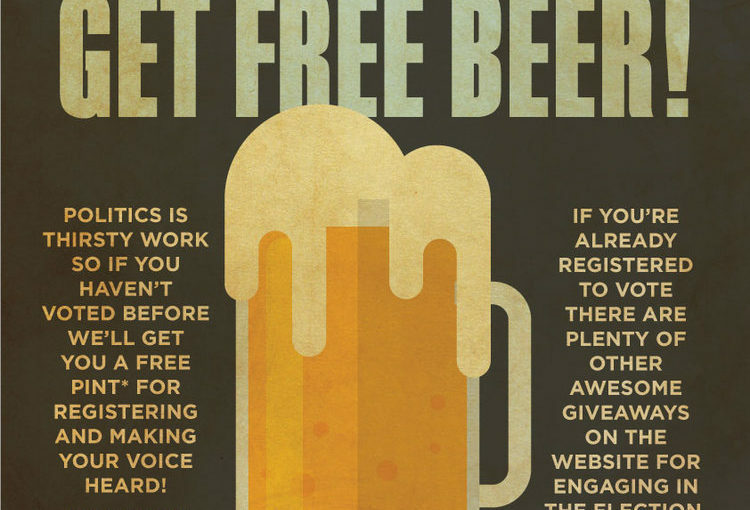 A coalition of pubs, breweries and student unions have joined together to create ‘Vote this year, get free beer!’ and provide information tailored for young people about how to register to vote. All those who register can then take proof of their registration on the electoral roll to one of the participating pubs and claim a free pint. 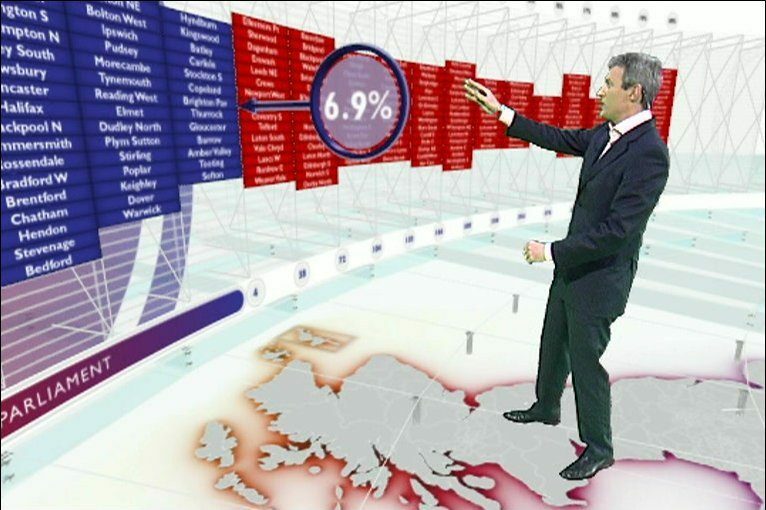 The Geese and Fountain will also be showing the election results live on June 8th, staying open into the early hours of June 9th, so you can find out if your vote has had the desired effect. Tickets for the election night results party will be available from the pub from next week. Posted on May 12, 2017 Leave a comment on Vote this year, get free beer! World Gin Day: 25 gins, a night to remember. If you can. Saturday, June 10th is World Gin Day. That’s too good an excuse for us to miss it, so we’re bringing in some very special gins, stocking up on tonic and practising our cocktail making. 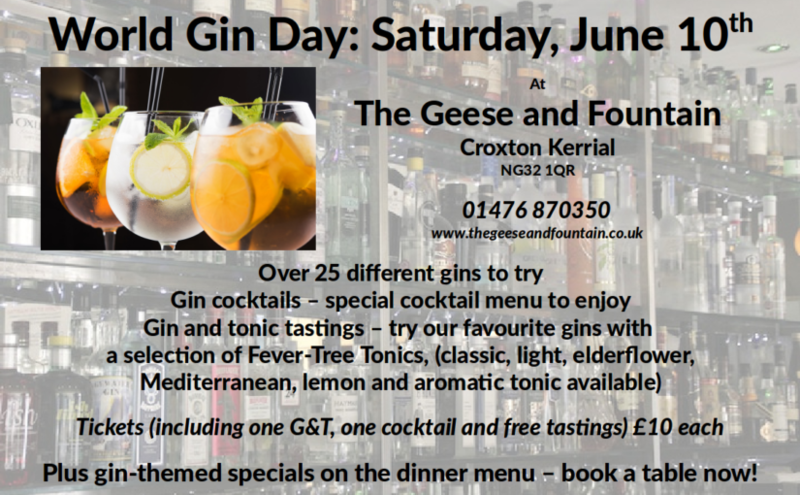 We will have a very special gin-themed evening for you – with gin-infused specials on the menu for dinner, a one-night-only gin cocktail menu, and a selection of very special gins for you to try. On their own, with tonic, or in cocktails. The choice is yours. Tickets (including some free tastings, one premium gin and tonic, and one premium gin cocktail) are £10. After that, just pay for your drinks as you go along. If you’d like to book a table for “gin dinner” at the same time, just give us a call on 01476 870350. Posted on May 11, 2017 Leave a comment on World Gin Day: 25 gins, a night to remember. If you can. We’re planning something a little different on Thursday, June 8th. In case you’ve been living in a cave for the last month that’s the date of the upcoming General Election, called somewhat surprisingly by Prime Minister Theresa May last month. We don’t see a lot of the big hitters from any party out here in Croxton Kerrial, but that doesn’t mean politics isn’t important to us. And whatever your hopes and fears for election night, we hope you’ll come and spend the evening with us. We’re aiming to have a late bar, and serve some light snacks through the night (licence extensions applied for), and we’ll have the BBC News election coverage on the pub TV. So if you’re as excited by swingometers as we are, you can share the excitement as a social occasion in the pub, rather than sitting at home on your sofa watching the election results with a cup of tea and having to raid the fridge for snacks. Whether it’s “four more years” or a historic shock result, you won’t want to miss out on the drama of watching the results unfold. From the first constituency (probably Sunderland again) to the formation of a new government, we’ll be staying up for it all. Come and join us.